Do you want to increase sales and outshine the competition when marketing your listings? You may want to consider using top quality aerial photography and video for your business. Drone photography is growing in popularity, giving businesses an innovative, dynamic pizzazz that attracts and maintains clientele. Take advantage of these benefits today with Cornerstone! We now offer aerial photography for your residential, commercial, luxury or new build homes. In order to fly a camera drone for real estate marketing, our drone photographer has obtained a FAA UAV operator’s certificate, training and years of experience. 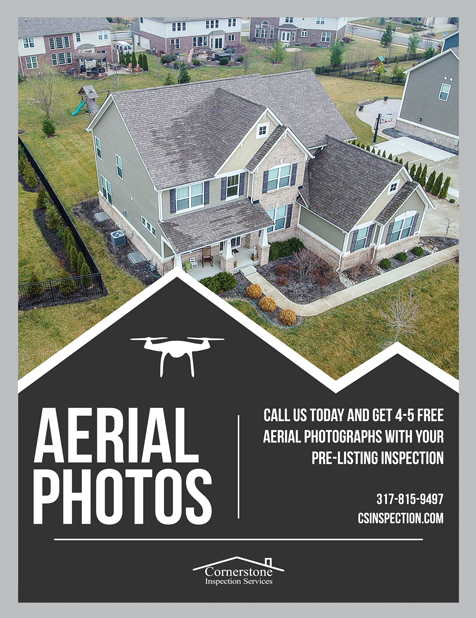 Also, DON’T MISS OUT—when we do your pre-listing inspection, you will get 4-5 aerial photos FREE! Call or send us a message to get started!